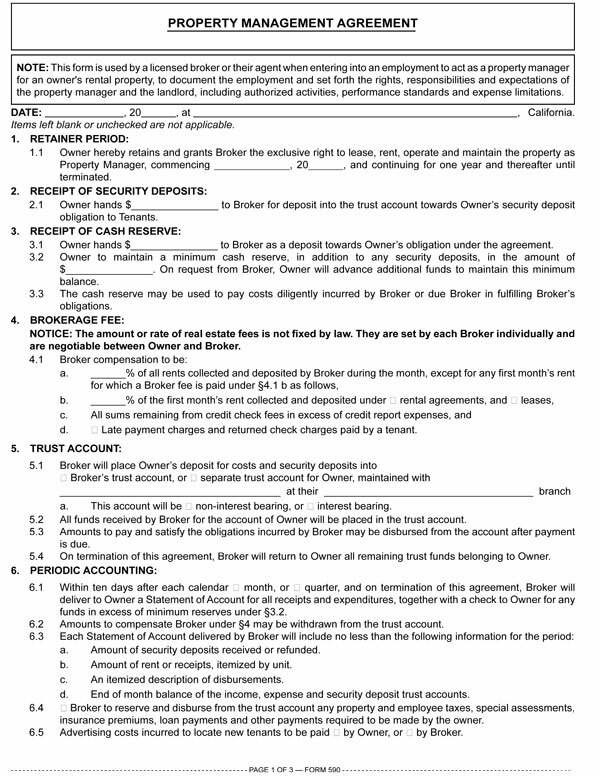 This form is used by a licensed broker or their agent when entering into an employment to act as a property manager for an owner’s rental property, to document the employment and set forth the rights, responsibilities and expectations of the property manager and the landlord, including authorized activities, performance standards and expense limitations. Brokers in the property management business need to enter into highly detailed management agreements which specifically identify and clarify the performance of the property manager and the expectations of the landlord. Generalized “short-form” property management agreements do not contain this degree of necessary detail. Instead, short-form agreements, by omission of certainty, permit the property manager to follow perceived industry customs — whatever those unregulated customs might be or become. These implied standards, while familiar to the broker, are often details about management that are misunderstood or unknown to the landlord. Disputes usually result when landlords have high expectations due to lack of details. In turn, they receive less than they believe they bargained for when they employed the property manager. Management obligations detailed in a “long-form” agreement provide greater protection for a broker from claims they have breached their duties to the landlord. Surprises are eliminated and client (landlord) expectations are more realistic as the agreement clearly states the duties of each party. Of course, the broker’s failure to comply with the detailed provisions in the agreement (and broader real estate law) is a breach which may cause the landlord a monetary loss and impose liability on the broker. A property manager’s authority to take possession and control of income-producing real estate and manage its leases, rents, expenses, mortgage payments and accounting in expectation of a fee is established in a property management agreement. information on hazard and worker’s compensation insurance for the property and employees. Under the Statute of Frauds, property managers cannot enforce collection of their management fees without a written agreement with the person agreeing to the payment, typically the landlord. Form updated 11-2015 to include the Form Description at the top, white header/footer convention and RPI branding.